A charming tree-lined garden suburb that is home to picturesque federation houses and apartments, and a small collection of waterfront homes. Cammeray also boasts a unique 9 hole golf course that has magnificent views of Middle Harbour, the golf course and its beautiful surrounds. Tunks Park can be found on the northern boundary of Cammeray where the local folk moor their yachts. You can also find a boat ramp for access to Middle Harbour. Cammeray has seen some rapid development over the past few years with a new Shopping centre complex and an ever growing eclectic array of cafes and restaurants. 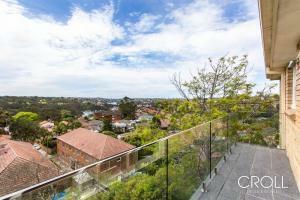 Being super close to the city – last bus stop before the freeway, makes Cammeray a very desirable suburb to live. Top floor fully furnished 2 bedroom apartment with amazing outlook !